I love colours, it's in my blood. So I decided to start a series on Colour Theory, sharing what I learn as I go. For today I'm going to start with the super basics and then show some examples for using complimentary colours in a decor scheme, and also show how you can put a twist on a complimentary scheme. I know y'all know this already, but colours have a natural order (like in a rainbow) where they merge into each other, and form new colours where they overlap. 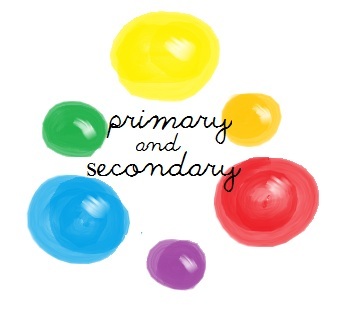 The big bubbles below are the 3 primary colours, and the smaller bubbles are called secondary colours (because they are made by overlapping the 2 primary ones on either side). Complimentary Colours are nothing crazy - just what happens when you grab one colour from the wheel, and then pair it with the colour OPPOSITE on the wheel. Any of these colours can be complimentary with whatever colour is opposite it. 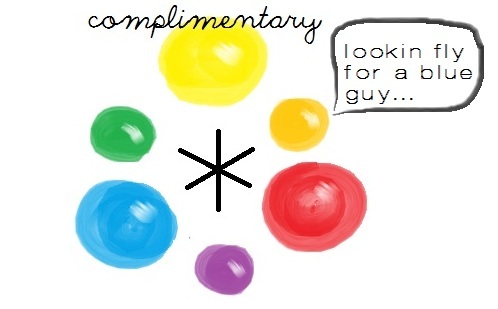 They are called complimentary colours because supposedly, they compliment each other. Just kidding, they compliment each other visually, not verbally. Uhhh, guys? I'm not sure I like these colours together. Aren't they supposed to be complimentary?? Yeah, sometimes it's just too much to use these colours in their raw form. SO here's how you put a twist on it: Take one or both of the colours, and soften it by either adding white, or adding a hint of another hue such as blue. You end up with a combo of pink and mint, which is pretty, and still complimentary as it stems from the original colours. 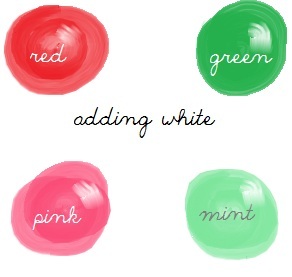 You could also add white to just one of the 2 colours, and it would still look great. OKAY, enough of the coloured bubbles, here are some sweet examples! It's that simple - take a pair of comlimentary colours, tone them up or down to suit, and away you go! There are essentially 3 combinations (the ones above) but you can make endless variations on them. I'm looking forward to getting a little deeper into colours next time, now that we've got the basics out of the way!! FYI, if I had to choose one complimentary scheme, it would probably be yellow + purple (splashes of gold, yellow, fuchsia...on a neutral base.) What would yours be?? 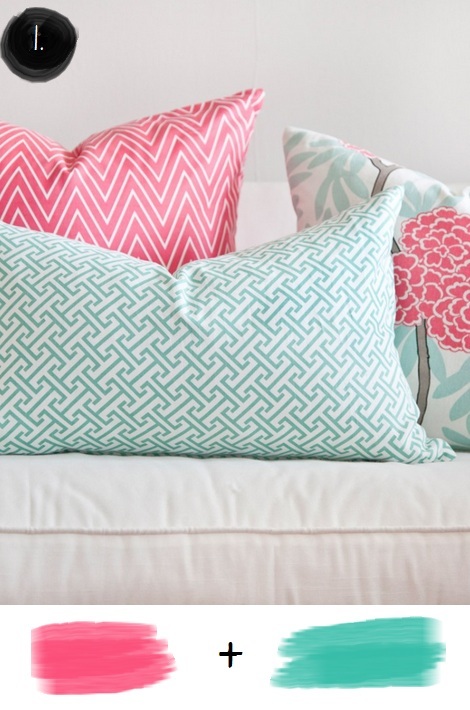 LOVE the pink and mint. So fun. Uhhhh.... love it!! Although I'm definitely thinking they can compliment each other verbally as well as visually. Also love the demonstration of how the raw complimentary colors can clash, but variations on hues can still reflect that complimentary relationship but pair much nicer together. Hit me with more!